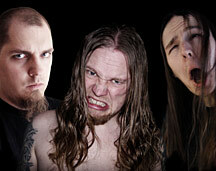 THOSE WHO BRING THE TORTURE: New Album Coming Soon! Swedish death metallers THOSE WHO BRING THE TORTURE have just signed a deal with SELFMADEGOD RECORDS to release their new album. Formed back in 2007 by Roger Johansson and releasing three albums on Pulverised and Metal Inquisition labels the band are back with the 4th full length entitled Piling Upâ. The material was recorded at The Rotpit and Studio Roadkill late 2013 and mixed/mastered by Brynjar Helgetun at Studio Brainjar early 2014. Artwork has been made by Roberto Toderico (SINISTER, ASPHYX).Piling Upâ features 10 songs of heavy, dark and crushing death metal that will definitely please all fans of HYPOCRISY, MALEVOLENT CREATION and GRAVE. Rogga Johansson (PAGANIZER, RIBSPREADER, PUTREVORE, REVOLTING, DOWN AMONG THE DEAD MEN, MEGASCAVENGER, BONE GNAWER) â guitars, bass, vocals and Dennis Blomberg (DOWN AMONG THE DEAD MEN, PAGANIZER)- guitars, bass.